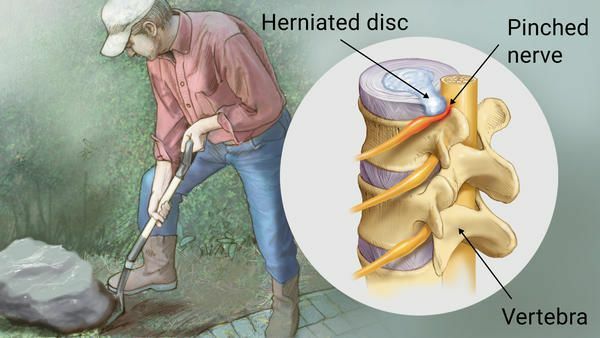 A herniated disc is a condition that affects more than 3 million people in the US each year. It is a condition concerning a problem with a rubbery disk between the spinal bones. s pushes out through a tear in the outer exterior. A herniated disk is sometimes called a slipped disk or ruptured disk. If you are having neck or back pains that travel down your arm or leg, seek medical attention. Most often, disk herniation is caused by aging-related wear and tear called disk degeneration. As you age, the spinal disks become less flexible and more prone to rupturing and tearing as a result of minor twists and turns. It can be often hard to pinpoint the exact cause of a herniated disc, but typically it occurs during the lifting of heavy objects with poor posture or twisting and turning. Traumatic events like falls or blows to the back are rarely the cause of herniated disks. The treatment options for a herniated disc usually depend on the severity and symptoms experienced by the patient. A few of the more common treatments that you may see are Medications, therapy, surgery, or alternative medicine.